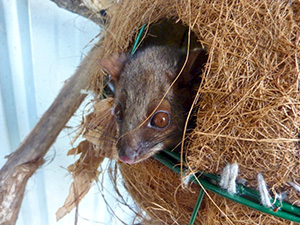 I have just spent four months caring for six orphaned ringtail possums. These orphaned babies are pretty and a delight to care for even though they require copious amounts of milk throughout the day and night. When they are starting to self-feed they leave their beanies and go into a sheltered aviary where they start to learn to become wild animals. 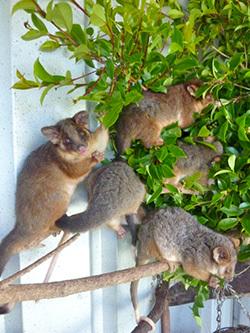 Again I spend time scouring the local parks and gardens gathering suitable leaves for them to eat. I also construct a drey out of hanging baskets for them to live in and eventually be released in. Release is a delight and a worry. Have I prepared them properly? is the chosen release site perfect? Will they be safe? I was happy to discover close to my home a wonderful site – great bushes and two of their favourite leaf varieties in abundance. So off I go. Happy. A week later I was checking out how they were faring and was not quite so happy. Here was a huge diamond python asleep on the now empty drey. Has the python just found a comfortable spot to rest or has he had a delicious dinner? I will never know but won’t be using that spot again. Life in the wild is a tough place. All I can do is the best I know how to prepare them for it.